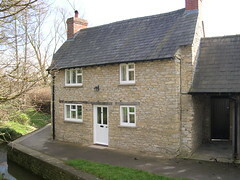 This house was flooded by the mill stream to the front of the property, the water in the house came up to above the window sills approx 1.2m high from the floor. I just wanted to thank you for the recent works, your team of builders were all very professional and polite. They took great care not to disrupt the house, and keep things as clean as possible. They were honest and explained everything to myself and my husband regardless of me asking too many questions! I have already had two people ask for your details, so am very happy to refer u. Hopefully we'll get enough saved for our major extension in a few years. Following drying out we removed all the damaged plaster, re-plastered painted and then fitted a new kitchen and shower room as well as decorating.